Zenon Stylianides (16) for Chris Paul, 54. Tashan Oakley-Boothe (15?) for Anthony Georgiou, 78. Aramide Oteh (15?) for Joe Pritchard, 78. 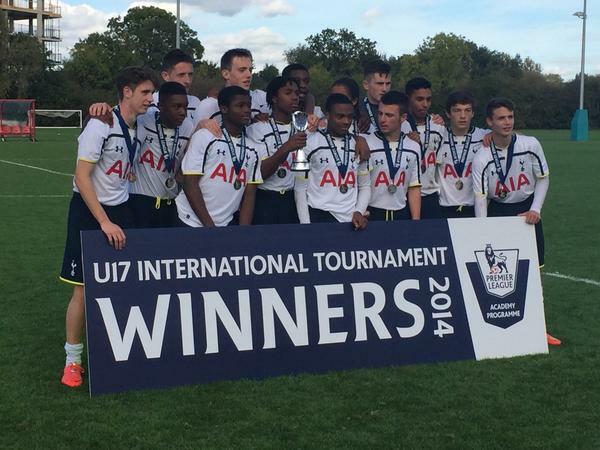 Spurs were missing Ismail Azzaoui (Belgium international duty), Ryan Loft (who was playing in the ongoing U17 tournament which we won*), Cameron Carter-Vickers who I suspect will be playing for the U21s on Monday, as well as recent substitute, Marcus Edwards, as the 15-year old was away playing for the England U17s (they won 4-1 against Cyprus and he bagged a goal and an assist). The starting eleven had a familiar feel, though, even if the substitutes bench housed some new names. Aramide (spelt “Aremide” on the team sheet so apologies if I’ve got this wrong!) Oteh and Tashan “Tash” Oakley-Boothe (who is supposedly one of the brightest prospects in our Academy) played in an U14 tournament last January so this was a big step up for both and an encouraging sign. The formation was sometimes 4-1-4-1 (with Amos the deepest midfielder), sometimes 4-2-3-1 (with Goddard as the 10), and sometimes 4-3-3. It’s also worth nothing that in the dugout for Spurs – amongst others – was part-time coach, Ledley King. There was a minute’s silence prior to kick off for Club Historian, Andy Porter, a regular attender of youth matches, who sadly passed away in the week aged just 54. For more information about Andy and his terrific work for the club, please see the obituary on the official site. It was a fast, open start with Spurs exhibiting pace in key areas. Anthony Georgiou expressed his intentions early with a powerful run down the left. He did well to get a cross in but when it was headed out to Pritchard, he volleyed well over the bar. A Reading free-kick to the left of the penalty box was taken short which gave Pritchard an opportunity to charge it down in typically fearless style, and the follow-up was blocked by Walkes. Spurs took the lead on 10 minutes. Walker-Peters won a corner and Georgiou’s kick looked harmless until Cy Goddard got a foot to a misdirected Walkes volley and looped the ball over the goalkeeper, landing it perfectly in the far corner. Soon after, Tom Glover was grateful to Luke Amos, who cleared off the line after the goalkeeper’s fumble in the box as the game became increasingly open. Joe Muscatt beat his man with a clever piece of skill and found Pritchard with an intelligent cut-back. When Pritchard’s low shot was blocked, Muscatt did well to track back and immediately regain possession. Georgiou teed up Goddard after another positive burst but his weak shot drifted wide. Harrison had his first glimpse of goal when he was found by Georgiou and hit a firm shot on the turn – it was easily blocked on this occasion but he doubled the lead minutes later. Chris Paul made a positive charge from right-back and fired in a low cross, Harrison darted across his man and finished deftly over the goalkeeper at the near post for 2-0. Reading’s number 7, Conor Davis, was proving a tricky customer, and he beat two men on the left but, as he cut inside, he curled his shot straight at Glover. Georgiou stood a ball up into the box but Goddard couldn’t quite meet the ball cleanly as he arrived on the penalty spot, and he sliced it wide. Harrison made a clever dart in behind and was found by a fabulous Pritchard long ball, but his attempted lob was partially blocked and then collected by the goalkeeper. Conor Davis beat Paul again and, when he was hauled down, the referee decided to call Paul over for a final warning. Paul nearly had more luck at the other end when he was picked out by Harrison, but he struck his first-time strike into the ground and off a defender and it ran to safety for Reading. Walkes won the ball well and found Georgiou, who beat his man and saw his cross blocked, only for the referee to give a goal kick – Georgiou let the referee know that he was not best pleased with the decision. Goddard nearly made it three just before half-time when the ball broke to him in the box and his left-footed attempt went just wide. Early in the second half Reading’s left-back, Jake Sheppard, got the better of Chris Paul and put in a threatening cross which fortunately (for us) fell just ahead of the forward. Spurs had a clear opening five minutes into the half when the ball broke kindly for Kyle Walker-Peters to run at two retreating defenders. He carried the ball most of the length of the pitch but, with Georgiou screaming for the ball at the far post, he couldn’t avoid the two men between him and his teammate, and his attempted pass was easily cut out. Reading went straight down the other end and Maghoma was called upon to do some sterling defensive work – he went to ground in the box, winning the ball cleanly and able to bring it clear, winning a free kick in the process. It should have been 3-0 and job done for Spurs When Walker-Peters delivered a fine cross from the right and Pritchard arrived right on cue, unmarked, but managed to plant his header well over the bar. Chris Paul eventually went into the book for a late challenge and was withdrawn three minutes later, Zenon Stylianides coming on with Walker-Peters dropping to right-back and Pritchard moving to the right side of the attack. Walkes lost his man in the box to offer a Reading sub, Harry Cardwell, a good chance, but he headed straight at a relieved Glover. Pritchard nearly forced a mistake from the Reading keeper when he pressed deep into the penalty area, but Lewis Ward just enough to avoid embarrassment. There was a bit of upset when the linesman flagged offside directly from a goal kick (Kieran McKenna told the referee he was “embarrassing himself”) – in fairness, the referee had a chat with his linesman and ordered a re-take of the kick with minimal fuss. Spurs brought on their two young debutants, with Oteh going wide right and Oakley-Boothe left, Pritchard and Georgiou the two players withdrawn. Oteh’s first action was to drive forward and win a free-kick – an encouraging start. Spurs’ centre-back pairing had been unflappable until Maghoma under-hit a square pass to Walkes, and Walkes pulled at the forward’s shoulder as he went to shoot. He got the shot away (which Glover saved) but it didn’t stop the referee awarding a penalty and showing Walkes a yellow card (which might have been red). Glover got two firm hands to Novakovich’s penalty and kept it out impressively, but the striker did get a goal minutes later, when he was played in on a sharp counter and impressively found the far corner with a precise low finish. Tom Glover 7 – cracking penalty save and, although he fumbled a few balls, I like his pro-active approach to goalkeeping. Chris Paul 4 – not his day today, but I’m sure there are many better performances to come. Anton Walkes 6 – the benefit of a midfielder playing at the back is the added ability to bring the ball out. Walkes did this well throughout and, aside from missing a few headers, and the penalty incident, he had a decent game. Christian Maghoma 8 – that one poorly-weighted pass aside, he was excellent. Joe Muscatt 7 – considering he’s a right-footed left-back who only started playing the role recently, he is coming along nicely. Showed a willingness to use his left foot and that keeps defenders guessing. Joe Pritchard 6 – as ever, a whole-hearted display which lacked subtlety. Luke Amos 7 – right place, right time. Enough said. Kyle Walker-Peters 6 – not his best performance, but his obvious threat attracts defenders, leaving space for others. Cy Goddard 7 – one of the best performances I’ve seen from him. Intelligent use of the ball, plenty of craft, and grabbed a goal too. Anthony Georgiou 7 – direct, quick, and a constant thorn in the side for Reading. Shayon Harrison 6 – took his goal beautifully but he left me wanting more. Zenon Stylianides – a very assured player in midfield who seems to be good at all the basics, which bodes well. Tashan Oakley-Boothe – he barely saw the ball so it’s impossible to judge him on this, but he’s a player who is very highly rated and it was very interesting to see him make the bench today. Aramide Oteh – as above; the few times he saw the ball he made it count with useful and confident runs forward. *As mentioned above, in the Premier League’s U17 International Tournament played over the last two days, we drew 2-2 with Crystal Palace and beat Juventus 2-1 to finish top of our group. In the other group, Leicester beat Arsenal 3-0 and drew 1-1 with Real Madrid. Today we beat Leicester 3-0 in the final. Edit: After some detective work, I think the players are: ?? ?, Jaden Brown, Ryan Loft, David Ajiboye, Charlie Owens, Kaziah Sterling, Japhet Tanganga, Armani Daly, Keanen Bennetts, Tom McDermott, Charlie Hayford, ??, ? ?, Nick Tsaroulla. George Marsh and Dylan Duncan are two of the players I’m unsure of. I wasn't sure that it was him (on the far left) as the haircut was not what I last saw him with! Thanks for correcting me, I've updated it. Terrific work! Lazar, eh? Interesting! Wonder if we'll see him for the U18s at some point this season?